"I think drugs are like strawberries and peaches." "I'd like to turn the whole world on just for a moment. Just for a moment." "I know a lot of rich people and they're all pigs." "I really like good, beautiful clothes. I love the space, Courreges things. I love Rudi Gernreich. I hate to go through seventeen buttons. I'm nervous enough going someplace." "Speed is the ultimate, all-time high. That first rush - wow! Just that burning, searing, soaring sense of perfection. There's no way to explain it unless you've been through it." "I'm greedy. I'd like to keep most of it for myself and a few others, a few of my friends. Keep that superlative high just on the cusp of each day so that I radiate sunshine." "Wherever I've gone I've been quite notorious. And quite innocently so." "I lived a very isolated life. When you start at twenty, you have a lot of nonsense to work out of your system." "I had fun, but I really didn't have anyone I particularly loved. And I still don't, except for loving friends, but I mean I haven't been in love with anyone in years and years. But I have a certain amount of faith that it'll come." "I made a mask out of my face because I didn't realize I was quite beautiful. God blessed me so. I practically destroyed it. I had to wear heavy black eyelashes like bat wings, and dark lines under my eyes, and cut all my hair off, my long dark hair. Cut it off and stripped it silver and blonde. All those little maneuvers I did out of things that were happening in my life that upset me." "You care enough, that you want your life to be fulfilled in a living way. Not in a painting way, not in a writing way ... You really do want it to be involved in living, corresponding with other living objects, moving, changing, that kind of thing." "They say use it, channel it. Do it, like there will be a sign, be an artist, you're so creative, do anything, you've got to do it, use it. Then, things like, and you've got to collect yourself too. I mean, you know, make your hair more about yourself, self-respect. But I mean, ridiculous." [About a dream she had] "It's like my having to walk down thousands and thousands of white marble stairs ... and nothing but a very very blue sky, very blue, like ... Yes, and I'd have to walk down them forever. I never thought about going up ... I don't know, don't you think that must mean something? It never occurred to me to turn around, I mean, why didn't I think that way? This was after I had the car accident." "It's sort of like a mockery, in a way of reality because they think everything is smiles and sweetness and flowers where there is something bitter to taste. And to pretend there isn't is foolish. I mean the ones that wander around and know, at the same time, and yet wear flowers, and they deserve to wear flowers. And they've earned their smile. You can tell by people's eyes." This is such a lovely post! 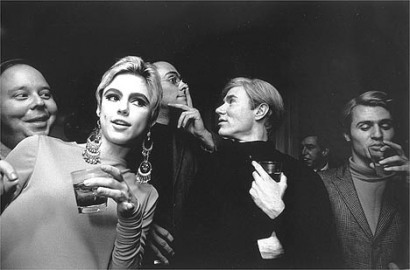 Edie was one of my first style icons and still remains so today. I am definitely going to have to buy some of those fabulous earrings...thanks so much for sharing. How chic! You can never go wrong with Edie. She has left a significant mark on fashion for time to come and I don't think she will be going away anytime soon. Love the post dear. i love the quotes too, i had no idea she was such an insightful person. i honestly don't know much about her, just seen pictures.